How to convert from PAL into NTSC color system? It might happen that you have recorded a home DVD-video disc but your DVD player or TV set does not support the color system used to record the video on the disc and cannot playback it. If you still want to watch the video you can try and reconvert it from one color system to another using AVS Video Converter. It is worth mentioning that cross color system conversion is a very complicated process and cannot be done easily thus we can advise to reconvert your video into another color system only if you really have to and bear in mind that the output video will not be perfect. We will explain the conversion process and arising difficulties below. In the list of Profiles (Profile field) select one of the preset NTSC profiles. In case they are not the same, in the Output Video Aspect section of this tab select the aspect exactly the same as it is in the source video (in our case it is 4:3). All the other differences produce no trouble to the output video. But these two dramatically influence the output video quality. 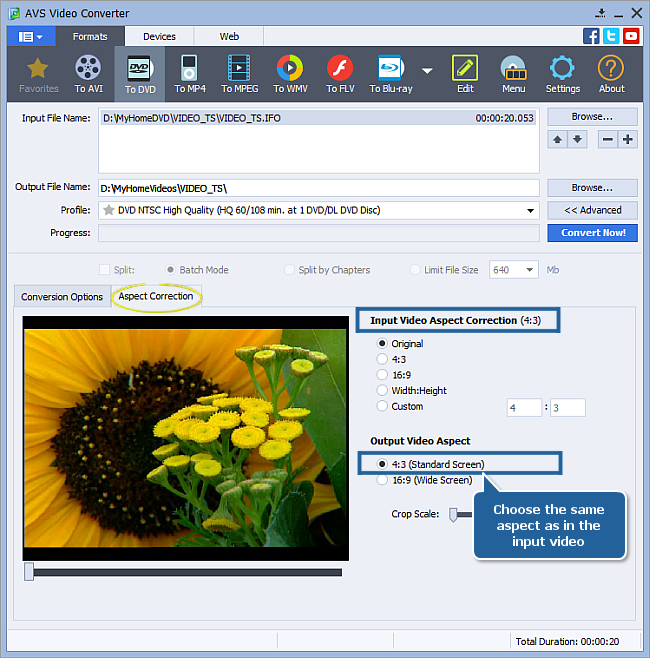 AVS Video Converter solves the difference in the image height using the aspect feature - it keeps the video proportional notwithstanding its physical dimensions change. This does not affect the video too much if it contains scenes with little fast motion, but in case you convert a video with lots of actions the video image will judder producing an unpleasant jerky effect. This cannot be got rid of so far that is why we really recommend to convert between the formats only if you really have to. 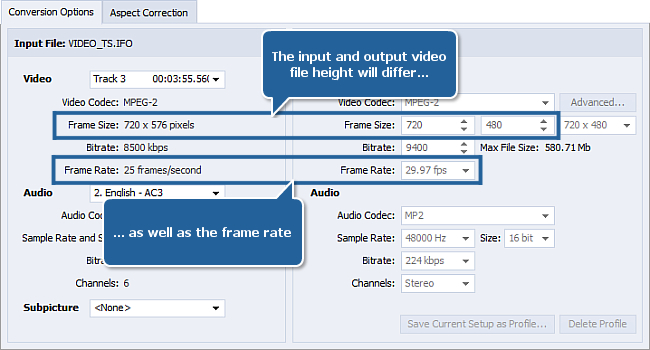 Note: this will allow you to avoid the unnecessary distortions and judder effects in the output video. After you have set up all the conversion parameters, hit the Convert Now! button to start converting. 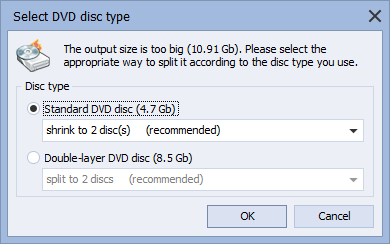 You can either select a standard single layer disc - in this case your output video will be shrunk to fit it - or, if your DVD drive supports writing to double layer discs and you have such a disc available, fit your video to one double layer disc without quality loss. Click the OK button to start the conversion process. You can visually judge the conversion process if you click the Advanced>> button. Select the Burn to Disc... option to record the output DVD onto a disc. Insert a blank DVD into your computer optical disc drive. Make sure that the disc is compatible with your drive. AVS Video Burner application will be launched to guide you through the burning process so that you could record your converted video onto a disc. You can select the necessary disc drive if you have several, refresh it and mark the Verify disc check-box to make sure the disc is recorded correctly. Now click the Start Burning! button to begin the recording. Note, that if the disc is not empty you will be offered to erase it. If you do not want to do that, you can eject the disc and use another one instead. After the burning is over the disc will be ejected automatically. 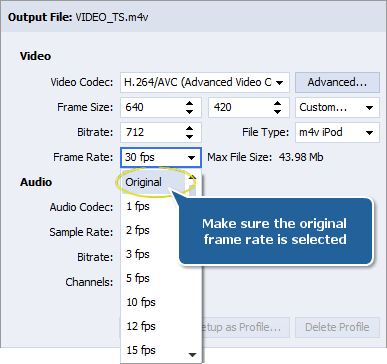 Note, if you checked the Verify disc, the recording will take a little longer depending on the size of the output files as the program will need time to verify them. Now you can watch your recorded home video DVD on your Home DVD Player!